Healthy life in the soil - feel it, smell it and even see it. …..the most unbelievable things I see come from the soil additives that are sold here. It seems like they're willing to say almost anything. You'll see terms like "Balancing the soils," "Activating the microbes," "Stimulating root growth," and "Doing it all nature's way." What you won't see on their labels and websites is bona fide research from the country's Land Grant Agricultural Universities. What you will see is a bunch of vague hooey and testimonials from people who probably wouldn't know good soil if they fell into it. Real soil scientists just shake their heads at these quack products. The truth is that all these products offer is inflated prices for virtually useless junk. Texas ought to require proof of performance for all the claims that are made. But, for now, let the buyer beware. This writer has been negative about organic concepts, techniques and products for many years, but this bit of vitriol takes the cake. Besides the poor grammar, this missile attacks the exact issues that are critical to growing healthy plants and saving water. Balancing the soil is indeed important. If the biology, chemistry and physics aren’t balanced, production will suffer. Activating the microbes is our goal. Beneficial soil microbes produce the true soil fertility. 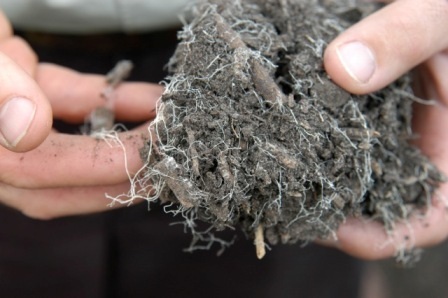 Stimulating root growth is the key to healthy, productive plants. And, we absolutely do work with nature’s laws and systems rather than try to control them. As a result, gardening, landscaping and farming is easier, more productive and more fun. My part of the seminar this Saturday, January 19 will be about the importance of building and maintaining the Life in the Soil. Hope you can join us – you can watch and listen online. To discuss this newsletter or any other topic, tune in 8am -11am CST to the Dirt Doctor Radio Show. The call-in phone number is 1-866-444-3478. Listen on the internet or click here to find a station in your area. Organic Club of America Members can log in on Sunday mornings to see the Dirt Doctor's Live Broadcast.